Alec Paul stayed up all Monday night building the "Love Army". University of Omaha student Alec Paul couldn't sleep on Monday night. The Bachelor of Fine Arts student needed something to do, so he ventured out in the middle of the night to Leavenworth Park. 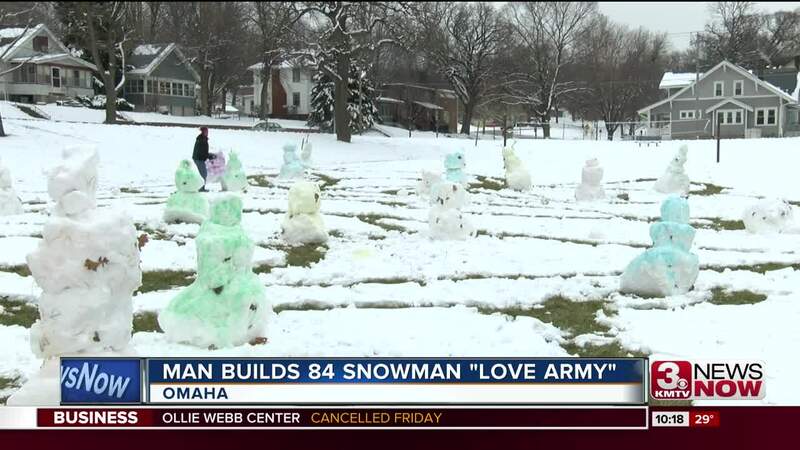 Then he built 84 snowmen, which he calls the "Love Army". For about nine hours Paul rolled snow, building each snowman in the dark until he quit from exhaustion. On Wednesday, he was out at the park again adding more color to his art. He said that would be the last day he'd work on what he calls "Love Army"..